In our contemporary world, everything is so fast paced that sometimes we forget how to just slow down. Our devices do a good job of keeping us up to date with the outside world, but they also keep us up until the wee hours of the morning. And then , we wake up tired, exhausted, and cranky the next day. This in turn affects our creativity and drive at work, and lessens our overall productivity. It has never been so difficult or so important to get a good night’s sleep and wake up fresh for the next day. A good night’s sleep recharges our immune system, helps to promote heart health, improves memory and retentiveness and mental alertness and can even keep hormonal balance steady. It may be ancedotal, but it is true there are very few things a good night’s rest cannot fix. Many things, however, do come in between our much-needed sleep and us. People living in urban areas will identify most with the nuisance of urban noises-traffic, loud neighbours, phones going off at odd hours and all sorts of distractions that can keep you tossing and turning through the day. For maximal sleep, all these noises need to be eliminated and the body relaxed to a point where restfulness is achieved. 2 Introduction What Are Wakeup Lights ? 3 Why Do We Need Wakeup Lights? 4 How Do Wakeup Lights Work? 5 How To Buy Wakeup Lights? Based on our three-step process , here are the top 10 best wakeup lights you should consider buying. Philips is a leading name in light manufacturing and they have continuously backed up this reputation with products packed with many desirable features. the Philips HF3520 leads the pack of wakeup lights manufactured by Philips. It is a consistent bestseller on Amazon and does not just claim that position; it justifies it with its very useful features. The unit has up to a 20-minute brightness setting. This unit was created with Philip’s Clinical Sleep and Respironics Healthcare Knowledge, a research that was borne out of more than 100 years of Philips light engineering work. Contains an FM radio option in addition to the five other alarm sounds it can make. Includes both sunrise and sunset settings, making it not just an alarm clock for the mornings, but also useful in winding out at night. Has a variety of up to five alarm sounds to wake up to. It comes with a snooze that lasts only 9 minutes and so there is no danger of oversleeping after snoozing. The bulb is long lasting. The unit can be shipped internationally. The alarm settings are a bit complicated and take some getting used to. With an average of 4.5 stars out of 3,131 glowing reviews on Amazon, it is clear that it is a celebrated favourite and occupies that position proudly. Like every Philips product, there is a dedication to quality; effectiveness and design that makes it stand out as a consistent leader in the wakeup light market. Customers have reported more restful sleep and all-around well-being increased with use, it is not harmful to the users, and it is aesthetically designed to be attractive. All these and the other wonderful features make the HF3520 the arguable best wakeup light according to customers everywhere. Another product from Philips is the HF3470 , this wakeup light has the same basic features as the others. 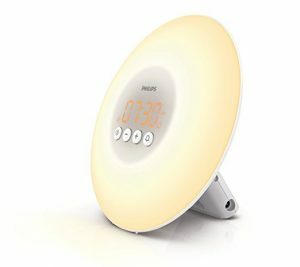 It wakes you up with an increasing glowing light like the natural sunrise it is one of the oldest models of the Philips wakeup lights and has continued to deliver quality making it a favourite among the others on this list. In fact, it is notable that this Philips HF3470 was once given to a town of people in the Arctic during their blackout months of darkness. The HF3470 is more regular in design, looking like one would expect a lamp to be and less like a glowing orb that tries to mimic the sun or the moon. Instead, it has a rectangular-conical shape looks more like a bedside lamp than the others. The lights increase gradually, simulating the dawn and making waking up naturally possible. 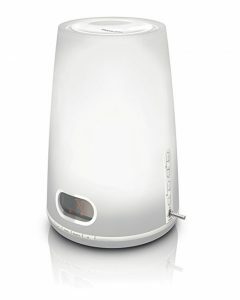 Like other Philips products, the light is an official Light Therapy Product of the National Sleep Foundation. Light intensity increases gradually over a course of 30 minutes before the alarm time, making waking more relaxed. This light is clinically proven to make getting out of bed easier and pleasant and promote a less stressful day. The light intensity is adjustable to increase comfort for people who are more sensitive to light than others. It can double as a bedside lamp. The light is UV free, making it safe to use. The light is white; this could be uncomfortable for some people. The alarm choices are limited to only two sounds. The HF3470 is a crowd pleaser, as one of the oldest models of the wakeup light available. It has been tested and trusted by thousands of users who keep coming back to buy this product even though there are newer and more aesthetically [pleasing models out there. Quality like that is recognised and celebrated and is only attainable by a consistent insistence on giving only the best to the customers. With an average of 4.3 stars out of 1,692 reviews, the HF3470 wakeup length proves to continue being one of the best wakeup lights available. 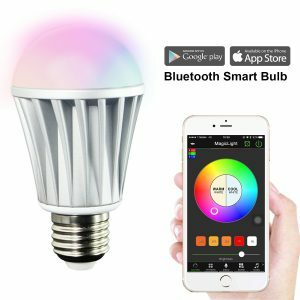 The Magiclight Bluetooth Smart LED Light bulb is on this list because of its quality, multipurpose function and high adaptability. A Bluetooth-enabled light bulb combines the conventional features of energy-saving lighting with smart features that can be operated and controlled from a Smartphone. 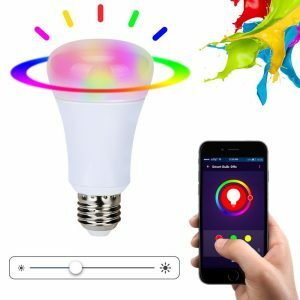 The bulb has a colour palette of over 16 colours for different moods and occasions and each light change can change the atmosphere of the room from dreamy, to romantic, to festive, to lively, all from one convenient touch on your Smartphone. All these features are in addition to being an effective wakeup light with a sunrise-simulating function and a sunset dimming function for nighttime. Power: 110 volts, 7 watts. The Magiclight has a companion application MAGICLIGHT BT available in the app store or in Google Play Store that is used to control the lights. The light comes with a colour palette of over 16 colours, each of which has adjustable brightness settings and is dimmable. The colours are also customisable. There are also different tones of white light available to suit different functions like reading, sewing, etc. The music sync function helps to automatically choose the type of music to go with the light change from smooth jazz to classical to rock or urban music. The bulbs can be controlled individually or together as a collective light source. There is a preset timer function for setting sunrise and sunset times the bulb gradually brightens for sunrise, and gradually dims for sunset. The bulb is energy saving, with a power consumption of 7 watts delivering 20,000 hours of light. This saves up to 80% of power. Since the lights are Smartphone controlled, their use is limited to only people who have or can afford a Smartphone. The Bluetooth function makes it unavailable for non-Bluetooth enabled devices. True to its brand reputation, the Philips HF3500 has all the essential features of a standard wakeup light. It has the sunrise stimulation with white LED lights, a convenient tap snooze, variable brightness settings and even an option to convert it to a lamp light. The lights are backed up by alarm chimes to ensure wakefulness. The lamp lights can be adjusted in brightness to suit the time of the day. Has a natural glow reminiscent of the sun’s rising that gradually increases in intensity until the room is filled with a bright yellow light. The tap snooze function makes snoozing easy. There is a gentle beep at the end of the sunrise simulation to nudge you awake completely. The beeping sound increases in volume every one and half minute until the alarm is turned off. The light intensity can be adjusted to suit individual preferences. The Philips wakeup light can also be used as a bedside lamp. The alarm sound gets gradually louder to coax from sleep gently. It doubles as a bedside lamp of different brightness settings. The design is attractive and modern. The unit is packed with lots of essential features. The product is cheap and essential. The unit does not heat up, so it is safe for children. There is no setting for sunset stimulation. The alarm chime sounds are limited. The clock display lights cannot be turned off, even at night. They can be turned down though, which comes in handy. The Philips HF3500 is multi-functional and effective, boasting an average of 4 stars out of 1,207 reviews on Amazon, an impressive feat. It does a good job of keeping the Philips reputation while also keeping up with the unique features that make Philips a leading name in light technology. The Withings Smart Sleep System is a smart alarm system packed with lots of futuristic features that revolutionize sleep and wake cycles and makes getting a good rest scientifically ensured. This product is a premium product for people who place value on technology that can improve all round health. 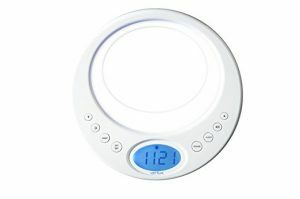 Aura products are linked the activity trackers, bathroom scales, thermometer and blood pressure monitor running with the sleep trackers to give a comprehensive report on the user’s health. Boasts an advanced sleep metric system that tracks sleep and improves sleep quality. Monitors the sleep cycle to wake you up at the best time with the light and music options. Multi-coloured LED dimming light technology that emits the right wavelength for melatonin secretion and thus influences an optimal sleep-wake cycle. Has a bedside clock and USB port for charging electronics overnight. Has a sleep and wake function: when it is bedtime, the Aura Smart Sleep System starts to emit certain red wavelengths of light that can influence the secretion of melatonin, causing sleepiness. When the wake time has reached, the unit’s light gradually increases with blue wavelengths that induce wakefulness and inhibit melatonin secretion, causing a smooth waking experience. The Smart Alarm adapts to the sleep pattern of the user by timing their waking and sleep times based on their patterns and data recorded by the Sleep Sensor during the night. Compatible with Spotify and Nest to play music as a wake function. Playlists can be compiled for both sleep and waking. A sleep sensor can be placed under the mattress to measure heart rate, body movements and breath cycles to analyse sleep patterns. The sensors in the unit can analyse sound, temperature and other environmental factors in the room that contribute to the quality of sleep both negatively and positively. It adapts to these patterns to promote better sleep by adjusting the alarm times accordingly. The interface is touch-sensitive and so does not need to be manipulated to work. The companion application HealthMate App can be assessed to track sleep and wake times, duration of sleep, how long it takes to fall asleep, and even how many times the sleep was interrupted at night. the data can be synced through the devices by Bluetooth or Wi-Fi. Has special settings for naps and short rests. Effective light and sound therapy. It can be used as a standalone device without the sleep tracker. The initial setup can take some getting used to before a rhythm is established. The touch interface can also be difficult to master. The sleep tracking exhibits some glitches. The Withings Aura is a sophisticated unit that will be valued by forward-thinking people who appreciate technology. It has been rated at 3.5 stars out of 261 reviews on Amazon and is a very impressive unit for its price. 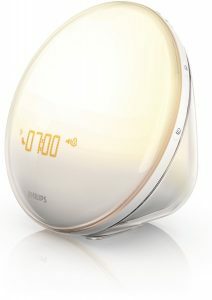 Verilux wakeup light brand makes a statement with its unique design. For users who are more acquainted with the other, more rounded and globe-like designs, it might be a bit unusual but do not let the shape keep you from enjoying the many benefits the Verilux offers. This unit is highly adjustable, with 8 buttons controlling options to change the duration of the sunrise and sunset functions, options to dim the lights display brightness and to choose the preferred wakeup alarm sound the radio, music and even sounds from nature. It aligns with the body’s circadian rhythm to regulate normal sleeping and waking patterns. It is a homoeopathic, drugless way of handling insomnia and fatigue. It has up to 20 brightness levels. There is an FM radio option for wakeup sounds including natural sounds. Battery backup is a handy feature. The light is quite modulated and is suitable even for people who have sensitive eyes. It can be turned low and used for a night light. Limited options on how many alarms can be set at once, with options stopping at one. The days for the alarm cannot be chosen, if one wants to turn off the alarm for a day in the week, the unit has to be unplugged the day before. The settings are complicated to set up. The speakers have been reported to be somewhat low quality. The Verilux wakeup light boasts an impressive 3.5 out of 187 reviews, showing that is dependable and functional. If one needs a wakeup light that is not expensive and yet has features which make it long lasting and useful, the Verilux will fill those needs admirably. Sound Oasis’ Natural Wake and Sleep System helps you to sleep deeply and wake up even more refreshed. 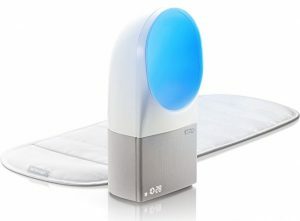 The manufacturer has described it as a “sound therapy machine” , as it combines the conventional wakeup light features with soothing sounds and an aromatherapy feature that releases soothing smells as the unit heats up with the sunrise feature. This makes waking an all round pleasurable experience. It also has a white noise feature for people who have trouble falling asleep to other sounds. Has up to six soothing nature sounds (mountain stream, forest stream, thunderstorm, ocean surf, spring rain and white noise) that have three play options: 30 minutes, 60 minutes and 90 minutes. The nature sounds can also be set for continuous play for users who want the soothing sounds through the night. Contains aroma beads with up to four different scents that diffuse a soothing smell as they are heated up by the metal tray of the Natural Wakeup and Sleep System, making waking a pleasurable and relaxing experience. This option can also be bypassed if the user so prefers. iPhone/iPod/MP3/CD dock for music playback. The wake-up settings can be customised to different combinations: nature sound only, nature sound and light, nature sound, light and chime. All these are customised to the user’s preference and personality. This wakeup light is cheap when compared with the features. The unit is bulky and unwieldy; it is not suitable for travel or carrying around. The Sound Oasis Nature Wakeup and Sleep System is truly amazing, with an impressive 3.3 stars out of 94 reviews on Amazon. This is no surprise as it is packed with features designed to promote restfulness and a blissful waking experience, with adjustable lights and the aromatherapy option, which is a favourite among reviewers. Added to that, it is inexpensive when compared to other wakeup lights. Another stellar product from Verilux, the colour changing LED system of this Serenity product is what makes it stand out among other products of its type. The Verilux serenity helps to regulate your sleep and wake cycle with a light and sound prompt that starts building in intensity fifteen or thirty minutes before the wake time. This synchronized sleep and wake system builds on the body’s cues that regulate sleep and waking, promoting a restful sleep. It is possible to choose a soundless function without music for wake and sleep time. The sleep and wake feature promotes with its sunrise and sunset lights. The large LCD display makes visibility clear from different angles. The unit is highly adjustable, with 8 buttons controlling options to change the duration of the sunrise and sunset functions, options to dim the lights display brightness and to choose the preferred wakeup alarm sound – the radio, music and even sounds from nature. The Verilux Serenity boasts an average review of 3 stars out of 79 reviews, a dependable brand with good features that customers keep coming back to. Attractively designed and effective, the Lumie Body Clock is a natural wakeup light alarm that simulates the sunrise that brightens in intensity over 15, 20, 30, 45, 60 or 90 minutes depending on the preferences of the user. When winding down for the night, the sunset feature helps to relax and lull the user to sleep. This wakeup light comes with a quirky rooster alarm feature that wakes the user with a smile. The wakeup light can double as a bedside lamp for reading, and the brightness feature can be adjusted to suit the user. There are multiple display languages available, making this wakeup light adjustable to different places. Can double as a night light or bedside lamp. 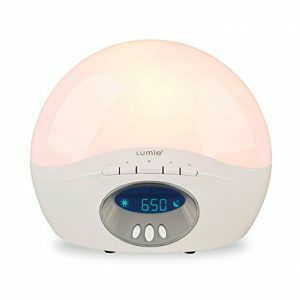 The Lumie wakeup light unit is a bit pricey. The Lumie is simple and effective, like most of the best things are. The controls are easy to operate and the multi-lingual function is an added bonus. Average reviews of 3.5 stars out of 59 reviews make it a dependable product with favourable customer reviews. The Xenon is Smartphone controlled and functional, while also being cheap and accessible the wakeup light is easy to install and control with the companion application available on Play store or the Appstore. It is a collection of lights that work together to create an ambiance in the room, giving it different colour hues depending on the whim of the user. This will especially delight children who will love the many changing colours and will appeal to people with an artistic and whimsical nature. The Xenon wakeup light unit is easy to install for people with different levels of mechanical expertise. The bulbs last long and do not run out easily, with over 16 colours available including a white light for reading. It can be remotely controlled with the companion application and a Smartphone, all that is needed is a Wi-Fi connection. The colours can also be customised to suit the function for which they are to be used. The wakeup and sleep light intensity can be adjusted to suit the mood and use of the light. The lights can be scheduled to suit the sleep and waking times of the customer, coming on and increasing in intensity until wakefulness is achieved. The unit is shock and vibration resistant. Multifunctional lights mean that it can be used for leisure and work too, and not just to induce sleep and wakefulness. Cannot be operated without a Smartphone and a Wi-Fi connection. The lights do not have a cooling function, and so when they heat up they stay hot. The Xenon boasts an average of 3.6 stars out of 31 reviews, it is a customer favourite due to its low-cost and functional features, from party, to gabfest with the girls, to game night with the boys, to a romantic night in, the Xenon has a light setting for every occasion. Nature Bright Sun Bliss doubles as a light therapy device that can be set up to mimic the sun’s bright rays on dreary days even as it gently wakes you up in the mornings. It can also be used as a portable lamp and it is travel-friendly, meaning that it can be used overseas. The Nature Bright also has a built-in backup battery and the clock display turns off at night so as not to disturb. This unit is compact and very useful and is pocket-friendly. 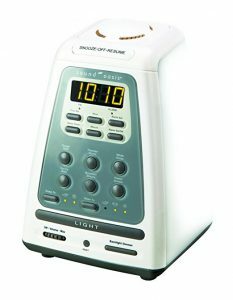 BioBrite Sunrise Clock Radio is a sunrise and sunset stimulator like the others but doubles as a reading lamp in a pinch. It has up to 24 hours battery backup so that it functions even when the electric power is out, and has the added function of weekday and weekend settings. Introduction What Are Wakeup Lights ? Over the years, basic alarm clocks have been the standard means of getting up out of bed early in time to beat that morning traffic. However, it is a well-known fact that those alarms are loud, annoying, and usually snoozed at least three times before wakefulness can kick in, and usually, the user is left feeling resentful and irritable. The blaring of the alarm clock has become so dreaded that it is now a subject of many light-hearted attempts at poking fun at the deep-seated annoyance felt when one has to wake up to one. A wakeup light is a solution to most, If not all sleeping problems. That feeling of lethargy and haziness needs to be turned to eagerness to start a new day and joy at a blissful night. A wakeup light is a different type of alarm that uses light to stimulate the brain to wakeup. Why Do We Need Wakeup Lights? Using a wakeup light is very prudent and effective in returning your body’s rhythms to normal as they are synced with the natural rhythm of morning and night. It is natural! Yes, the light itself might be factory produced, but it works on the natural principle of waking up with the dawning of the sun, bringing us ever closer to the earth. There is a reduction in stress hormones-especially early in the morning, as irritability from the alarm clock noise is eliminated and thus rushing to get ready for the day is minimised. When you wake up feeling refreshed, you are less likely to prepare for the day in a rush, and thus you are going into the world in a cheery good mood that everyone around you will surely appreciate and be influenced by. The lights replicate the natural sunrise, regulating the circadian rhythm and thus there is a balanced hormonal production, leading to overall improved well-being and health. For anyone with sleep problems, having a wakeup light will gradually let your body correct its rhythms. You will find yourself going to sleep much earlier and waking up refreshed. Heavy sleepers will sure appreciate this, as it not only produces an insistently increasing daylight-like light, the sounds also increase in volume to make sure that wakefulness is achieved. How Do Wakeup Lights Work? Our bodies are a tightly run machine, and this machine runs on a 24-hour cycle of day and night, called the circadian rhythm. This means that the body produces hormones like cortisol which peak in the morning and helps to keep us awake when there is daylight and hormones that help us to wind down and feel sleepy when it’s night like melatonin, a hormone that is produced about two hours to bedtime (depending on everyone’s personal internal schedule) and induces sleepiness. Wakeup lights produce an artificial dawn stimulation that gradually lightens the room in line with the natural sunrise, nudging you awake with the brightening of the day. They also come equipped with a soothing alarm backup which gradually increases in volume as the light gets brighter, helping you to wake up slowly and restfully instead of with a heart pounding from being abruptly jarred from sleep by a blaring alarm clock. This makes it so much easier to get out of bed and start the day. A standard wakeup light runs on a basic alarm feature that can be set up to tie to the wake time desired. In this way, it is just like a standard alarm clock. However, unlike a basic alarm clock, the lights start to brighten at a pre-selected time before the alarm goes off and continues to brighten into the wake time reaches, at which point the room looks like a bright morning. Wakeup lights also come with sounds to back up the lights, usually, soothing nature sounds that echo a dawning day and get louder as the alarm brightens up in intensity. How To Buy Wakeup Lights? A wakeup light is not just a glorified light bulb; it has to be able to gently stimulate wakefulness and alertness. The brand chosen has to have a light that strikes a balance between bright and soothing, and should not have an irritating glare. It should also be pocket-friendly and not break the bank. When looking for the best wakeup lights, reviews should always be taken into consideration and that is why this list will be valuable to any shopper out there trying to find the best ones for a blissful sleep. Step One: What type of light do you need? Would a stimulator in the mornings be enough, or do you also need a sunset light for the nights? Step Two: How big is your pocket? There are different brands of wakeup lights with a range of prices available. Step Three: Read the reviews and based on that, make a list of the best wakeup lights that suit your considerations. Step Four: Make a shortlist based on your choices, and choose from that list to make a purchase. Hope you found our list of best wakeup lights useful.